As news surfaces about Amazon possibly pulling out of its New York HQ2 space, Illinois officials jump in to restart the conversation about considering Chicago. See this NBC News story for more. Bisnow recently wrote about Amazon’s potential strategy to lease Sears stores for new Whole Foods locations. Glenstar Properties shifted plans from a suburban apartment development to office space, according to The Real Deal. January 2019 - In a recent survey conducted by Leading Lawyers, four partners at O’Keefe Lyons & Hynes were voted among the Top 10 Leading Real Estate Property Tax Lawyers in Illinois. Those in the top ten for 2019 are Mark Davis, number 2; Elizabeth Gracie, number 6; Kevin Hynes, number 7; and Jason Shilson, number 9. No other firm in the State of Illinois has more than one attorney ranked in the Top 10 for property tax law attorneys. Partners Brian Forde and Whitney Carlisle were also highlighted on the list for their commercial property tax law work. All attorneys noted above are members of the firm. 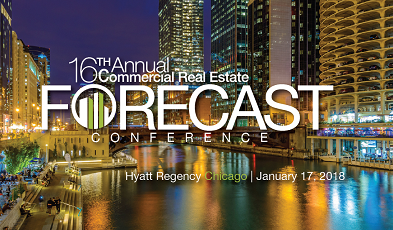 January 2019 - O’Keefe Lyons & Hynes Members Kevin Hynes and Elizabeth Gracie were featured speakers at the 2019 Commercial Real Estate Forecast produced by the IL Real Estate Journal. Kevin Hynes discussed retail trends and their impact on commercial real estate taxation, while Elizabeth Gracie moderated the office market panel. According to this story by the IL Real Estate Journal, the office panel featured discussions on how office property owners need to take some cues from the retail industry. Office tenants want more than just cubicles and a big lobby, for example. They want a unique and comfortable experience. The conference is in its 17th year and drew more than 900 attendees. September 2018 - O’Keefe Lyons & Hynes Member Elizabeth Gracie participated in a panel discussion at the annual Fall REIA/DePaul Real Estate Center Summit on September 27 at Maggiano's Little Italy, 111 Grand Ave., Chicago. She discussed the factors that weigh into property tax liability, including how local government budgets determine the size of the tax pie. See this IL RE Journals story for more. Summer 2018 - O’Keefe Lyons & Hynes Member Elizabeth Gracie was featured in the Women In Real Estate Directory, page 47, published by Rejournals.com, a division of Law Bulletin Media. 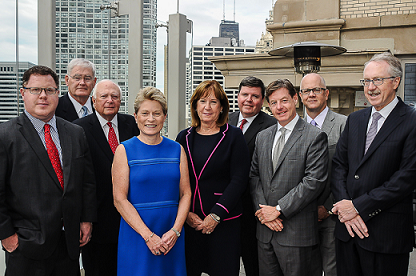 Chicago (May 1, 2018) - O’Keefe Lyons & Hynes, LLC and McCracken, Walsh, Carlisle & de LaVan have merged, bringing together two prominent property tax law firms in Chicago under the name O’Keefe Lyons & Hynes, LLC. McCracken Walsh, Carlisle & de LaVan was established in 1958. 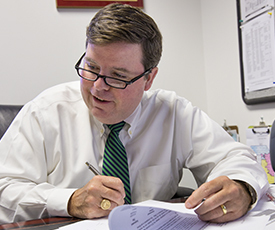 Its current principal, Whitney Carlisle, brings more than 22 years of experience representing Chicago area businesses in complex property taxation issues. 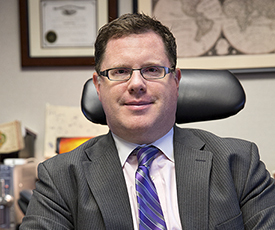 He previously spent 11 years in the taxation division of the office of the Cook County State’s Attorney. 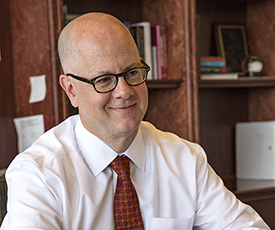 He is currently Vice Chairman of the Illinois State Bar Association’s State and Local Taxation Section Council and a co-chair of the Property Tax Committee of The Civic Federation. The merger also brings attorney Margaret Graham and several administrative staff to the O’Keefe firm. May 2018 - Our firm’s merger was highlighted in the IL Real Estate Journal. March 9, 2018 - O’Keefe Lyons & Hynes Partner John Nyhan discussed tax incentive programs in Cook County as part of this IL Real Estate Journal’s article. 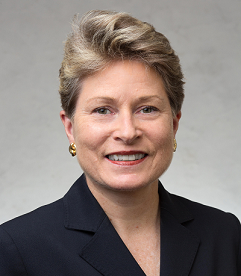 Elizabeth Gracie was featured in the Women In Real Estate Directory published by Rejournals.com, a division of Law Bulletin Media. February 8, 2018 - Three firms that work extensively in commercial real estate—O’Keefe Lyons & Hynes, McShane Construction and Applegate & Thorne-Thomsen, P.C.—were among the honorees at a recent gala hosted by Christ the King Jesuit College Prep (CTK). September 2017 - O’Keefe, Lyons & Hynes recently celebrated its 80th anniversary at an open house event for clients. 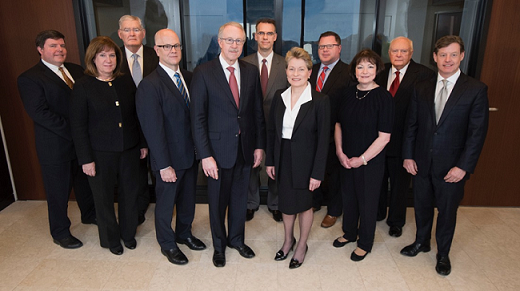 Pictured left to right, are: Brian Forde, Mike Heaton, Kevin O’Keefe, Elizabeth Gracie, Patricia Quinn Ford, John Nyhan, Jason Shilson, Kevin Hynes and Mark Davis. Since the start of the recovery from the 2008 recession, we have witnessed incredible growth in Chicago’s industrial market. February 17, 2017 - More than 900 attendees crowded into the 16th Annual CRE Forecast to hear what the experts had to say. Kevin Hynes spoke on the Retail Panel at the 2018 Commercial Real Estate Forecast Event.